I know I'm always full of excuses as to why I haven't updated ("My millionaire stepfather whisked me and four of my friends off to the Bahamas!" "I'm starring in the school production of Peter Pan!" "I got shipwrecked on a small island off the coast of Connecticut! "), but I actually have two semi-valid ones this time. 1. I just moved to my own place (it's pretty sweet, if I do say so myself) at the beginning of this month and all the pre- and post-move crap took over my life for a while. 2. I've been working on a few fashion related (though not BSC related) projects that I'm really excited about. "Sure you are, Kim," you say. And I don't blame you for that! But we can rebuild our trust. So, if you've ever wondered what my candy-filled club headquarters looked like, mosey on over to Catwalkqueen.tv and check out yours truly (okay, yours truly's closet, to be precise) answering the question of What's In [my] Wardrobe. "What should I wear in New York?" Claud asked once. "What you wear in Connecticut," I told her. "Believe me, you see everything in the city. Once I saw someone dressed as Batman." 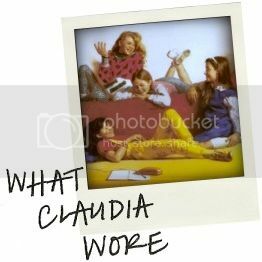 "Maybe it was Batman," said Claudia, giggling. "But really. What will your friends wear to the party?" 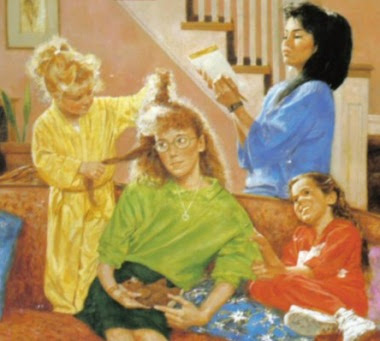 Later in the book, Mary Anne starts freaking out about Stacey's party and tells everyone Stacey has to tell them what to wear. Everyone's pretty WTF? about it, and Kristy suggests they wear their Hard Rock Cafe t-shirts. "They're as New York as you can get." Mary Anne then scowls at her and adds "You especially, Kristy. You wear what Stacey says." Kristy hopes that Stacey "says jeans, a sweater, a turtleneck, and sneakers, because that's all I brought. And who made you Fashion Boss of the World, anyway?" And this is a great example of why I love the early books. There was so much more drama! ". . . if it'll make you feel better, Mary Anne, I'll tell you what to wear. Let's see what you brought." (I glanced at Claudia's boxcar. She had just opened it and about twenty outfits had fallen out.) "And if there's anything you need to borrow," I added, "I'm sure Claudia will have it." "Stacey," Claudia began coldly, "for your in-"
And then Dawn interrupts with some happy hippie peacemaker speech (kidding, she just tells everyone to calm down and concentrate on getting dressed, which is logical enough advice.). However, I'm not really here for recapping purposes (that little snitfit was too good to ignore, especially since it was clothing related), so let's move on to the outfits. A half hour later we were ready. Well, maybe not ready, but at least we were dressed. Mary Anne looked at all of us (even me [!]) critically. Kristy was wearing a white turtleneck with little red and blue hearts all over it [ . . . yeah, I owned that turtleneck], a red sweater, jeans, and sneakers. "Claudia and I are not exactly the same size," said Kristy, who is not only quite short, but completely flat-chested. "Now get off my case." "Okay, okay . . . Stacey, is it all right if Kristy wears that tonight?" Mary Anne continued her inspection. Claudia had on the black outfit we'd talked about over the phone so long ago. [Tell me more.] And she was wearing her hair simply, for once - [you're not going to tell me more, are you] brushed back from her face and held in place by a white beaded headband. [Blair Waldorf approves.] Dawn had chosen an oversized [denim shirt] peach-colored sweater-dress, lacy white stockings [sassy! ], and black ballet slippers. I was wearing a short, short yellow dress that flared out just above my hips [is this a hilarious mental picture or is it just me? ], white stockings, yellow push-down socks, and these new shoes that my parents hate. [Again, she's teasing me. I'm pretty interested in finding out what exactly it is about these shoes that incurs parental disapproval.] It was an interesting outfit, one I'd thought up while we were dressing. And what was Mary Anne, the fashion plate, wearing? Well, here's a clue. She looked like she'd walked right out of the pages of Little House on the Prairie. [Snap!] I had chosen a bright, big-patterned [read: Cosby] sweater and a pair of black pants for her. She'd looked at them, shaken her head, replaced them in her suitcase and put on this other outfit - a ruffly white blouse, a long paisley skirt, and these little brown boots. In Mary Anne's defense, maybe she just borrowed Claudia's time machine for an afternoon. It seems like the fashion world is moving on from the 80s to the 90s right now, (which . . . I'm not sure how I feel about this, to be honest. I guess it's an excuse to start wearing my big clunky Doc Marten oxfords again? I don't know.) and she's pretty much got Sharon's look down pat. Stacey's opinion? It was very mature and attractive but, well, Mary Anne was the only one of my friends who, when dressed up, actually looked like she came from Connecticut. [Double snap.] We could tell, though, that the clothes were new and that she really wanted to wear them, so no one said anything to her, despite the grief she'd given us earlier. Okay, one last pimp before I end this entry: my good friend Courtney Summers just released the book trailer for her debut novel, Cracked Up to Be. Ch-ch-check it out. And now I'm off to watch Big Brother, because that show is like crack to me. For your consideration*, the first cover** to feature Ms. Mallory Pike. The girl can't catch a break, and she knows it. Look at her defeated eyes and slumped posture. And then there's Claudia, who is looking fierce. I'd probably call this bitchface on any other sitter, but Claud is just rockin' out. I'm gonna call shenanigans on the solid colored shirt, though. (No, I don't secretly work for American Apparel. It's just that the comparisons are really easy.) Where is the puffy paint? The beaded flamingo? Where are the Sequins of Creativity***? Mallory begins Chapter 2 by wondering what the revered thirteen year olds wear to their club meetings. Regrettably, she decides she should dress up. "I thought about Claudia and the other girls in the club. I was pretty sure that when they got dressed up, they wore trendy clothes like big, bright sweater-dresses or sparkly tops and tight pants." Well, except for Kristy. She wears lobster costumes. "After standing in front of the closet for so long that Vanessa made a pig face at me while she choose her clothes [. . . okay], I finally decided on my red jumper that said Mallory across the front, a short-sleeved white blouse, and white tights with little red hearts all over them." "'You look like a Valentine,' Vanessa told me, but I didn't care." A. You should have cared. B. Scathing sartorial critique from Vanessa! She's doing my job for me. Nice. Meeting time! Mallory tells us that "Claudia has pierced ears, uses makeup, and wears clothes my mother wouldn't even let me look at in stores, much less buy. Things like short, tight pants [shorts? capris? it's anyone's guess] with little ballet slippers, or torn t-shirts decorated with sequins [of creativity], or overalls and high-topped sneakers. And her jewelry! She has a bracelet that looks like a coiled snake, and earrings that are a dog for one ear and a bone for the other, and I don't know what else." Mary Anne appears to have borrowed an outfit from Stacey again: "a baggy yellow sweater with a silver squiggle pin near the collar, a short skirt made out of sweat-shirt material, yellow tights, and ballet slippers." And we get another description of what it means to be California casual (here described as "kind of casual"): "baggy jeans with the cuffs rolled up, shirts with the tails out, and big belts." Mmm. Thrilling. After Mallory's first meeting, Kristy drops her some helpful advice via the BSC notebook, which is kinda embarrassing since everyone's going to read it. This notebook entry has been lovingly recreated in Paint Shop Pro, because I'm not in the mood to mess with my scanner. Following this lesson in fashion, Mallory adjusts accordingly for the next meeting: "a pair of jeans, a sweat shirt that said I'D RATHER BE WRITING MY NOVEL, and a pair of sneakers. I figured I wouldn't look any better or worse [well. . .] than Kristy, and she was the president." It only took one meeting to break Mallory's spirit. One! She's completely given up and is now resorting to the worst of all sartorial crimes: dressing for comfort. Comfort! The horror! * I long to be on Team Griffin. ** from the dibbly-fresh gallery. *** This is the title of either Claudia's next book, or the band she assembles in high school. You decide! I've retained a troubling amount of information about books I read during my childhood. Proudly powered by Blogger and Modernist, a theme by Rodrigo Galindez. Converted by tmwwtw for LiteThemes.com. RSS Feed.